This was a clash between the second and third-placed teams in Lancs Central Division One so it promised to be a hard-fought match. Garstang started at pace and Holly Hunter was soon carving holes in the Rossall left wing. Rachel Roe was in good form and kept the pressure on Rossall. 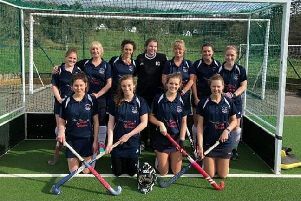 Garstang’s young team were passing superbly and were half-a-pace quicker than Rossall with the better stick skills. After six minutes, Garstang scored a superb team goal with the ball being fed by Wendy Howarth to Megan Coar to finish in style. Two minutes later, Garstang nearly scored again with Coar just missing out. Coar then set up Summer Muirhead to make it 2-0 after the ball went between the keeper’s feet. Rossall threatened Garstang on the break and had their best chance with a ball hitting the Reds’ post but being quickly cleared by keeper Rachel Orton. Garstang’s defence of Kathryn Watson, Holly Wilson, Vicky Singleton, Charlotte Willis and Jemma Hampson were in great form and had to be against a competent Rossall attack. They defended well and were constantly surging forward to support the attack. Hannah Crawshay made it 3-0 in the 16th minute with one of her signature raised shots from the top of the D.
Five minutes later, Garstang won a penalty corner for a foot in front of goal and Steph Roe powered forward to take the score to 4-0. Two further Garstang penalty corners came to nothing and a goal by Coar was disallowed following consultation between the umpires. Hunter hit the Rossall keeper’s pads hard and Coar made a superb break, only to be thwarted by the goalkeeper. Rossall came out stronger in the second half and won their first penalty corner, forcing a save by Orton and a quality clearance by Willis. Hunter made a strong break but it seemed that despite all her efforts she was not destined to score. Garstang had slowed and had to dig deep to hold a brave Rossall, who were winning more possession and threatening from the midfield. Hampson made some last-ditch interceptions and clearances. Then Hunter made a fast run down the wing, cut in across the top of the D, outpaced her marker and hit a classic reverse-stick strike to score past a shocked Rossall keeper for a well-deserved goal. In the last minute, Rossall won a penalty corner but Garstang defended well to deny them any consolation. This was a great team win for Garstang against quality opposition and the whole team played well, with five different players scoring. A quarter-final match against old foes Pendle 2nds beckons.